Were you invited to take the 16 Personality Factor (16PF) Questionnaire? The 16PF personality test is used by employers for employment, promotion, coaching, and career development. Understanding the 16PF is the key to excelling on test day and winning your desired job. Start preparing with our personality test practice materials today to achieve success. The 16 Personality Factor Questionnaire (16PF) is a personality test with 16 personality traits. The 16PF is used for various kinds of testing, including pre-employment and promotion testing. Ready to study for the 16PF? JobTestPrep provides you with quality 16PF preparation. We offer a range of pre-employment personality test solutions, helping to ensure you are prepared and confident on test day. Start practicing with our Personality Test PrepPack™ now. What is the 16 Personality Factor Questionnaire? The 16 Personality Factor Questionnaire (16PF) is a personality test that was developed over several decades by Dr. Raymond Cattell. He postulated that an individual's personality can be summarized into 16 personality factors. The theory behind this test also corresponds to the Big Five Model. One of the best ways to pass any test is understanding the material. In order to understand personality traits, we developed questions for each one of the traits. Thus, enabling you to identify the traits in real time in the test and when asked in an interview. Our professional guide explains what will be the optimized range of answers to use for each one of the traits. All in all, by purchasing our personality test and practice material, you get an exclusive and holistic learning experience which puts you on the top list of candidates for the job you applied for. The 16 Personality Factor Questionnaire asks about specific, everyday situations in order to assess your daily behavior, interests, and opinions. 16PF test questions identify and evaluate your abilities for future employers. Each item on the 16PF test has three options, and each answer choice is scored differently. The approval answer choice (True/Agree) is ranked as a 3, the question mark answer choice (?/Neither Agree Nor Disagree) is ranked as a 2, and the anti-approval answer choice (False/Disagree) is ranked as a 1. After you have completed the 16PF, your answers will be scored and summarized in a report. Your results also depict the general career areas that will most likely appeal to you based on your personality. There are seven career areas included in the report: Influencing, Organizing, Helping, Creating, Analyzing, Producing, and Adventuring. These areas are listed in a chart comparing your personality to the profession that is best suited for it. In addition, you are provided with a description of each career orientation area. 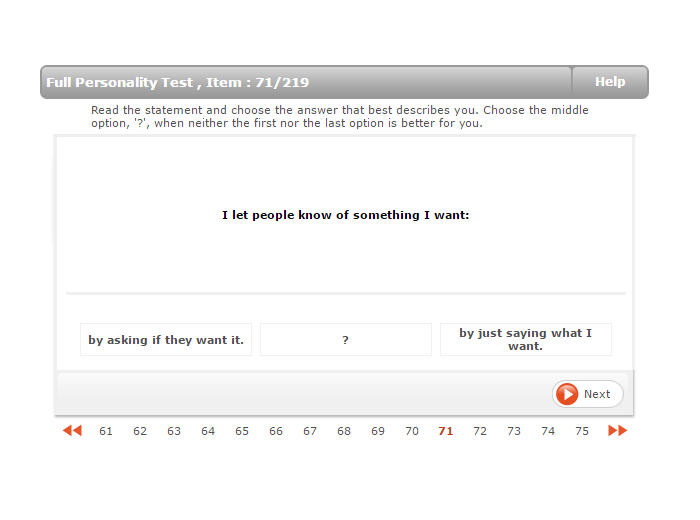 Below is a sample question from our personality practice test, which is styled like the actual 16PF test. Becoming familiar with the types of questions found on the exam will help you when you take the actual 16PF. Your 16PF test results are scored according to the job for which you are applying. Among the most important personality traits for potential employers are problem-solving, conflict management, communication, team-building, decision-making, and leadership. JobTestPrep offers you a personal, customized report of your personality test based on the specific job you want. There are multiple reports available for the 16PF for a variety of careers. Each report analyzes specific traits for different professional contexts. Some of the available 16PF reports are the Career Development Report, the Teamwork Development Report, the Management Potential Report, and the Psychological Evaluation Report. 16PF and other trademarks are the property of their respective trademark holders. None of the trademark holders are affiliated with JobTestPrep.